An absolute delight, Clematis 'Duchess of Edinburgh' is an old-fashioned white-flowered climbing clematis. The large pure white double flowers appear during May and June, and it will often flower again in September, when the flowers are more likely to be semi-double. The early blooms are occasionally green rather than white. Clematis 'Duchess of Edinburgh' was raised in the late 19th century by George Jackman and Son, England. 'Duchess of Edinburgh' can be grown against a trellis, garden fence, wall, arches, pillars, pergolas, clambering over tree stumps and through large shrubs or planted in a container trained up bamboo canes or an obelisk. 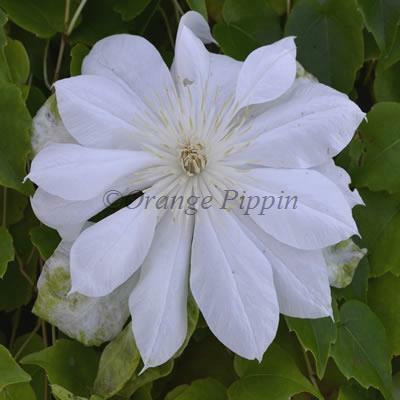 Reaching a maximum height of about 3m or so, it is not as large and vigorous as the Clematis montana varieties, and so is better suited to smaller spaces where a more modest climbing habit is required. It does best in full sun but will tolerate some shade, and can be planted in any aspect. A light pruning after the early summer flowering should encourage a second flush in September.